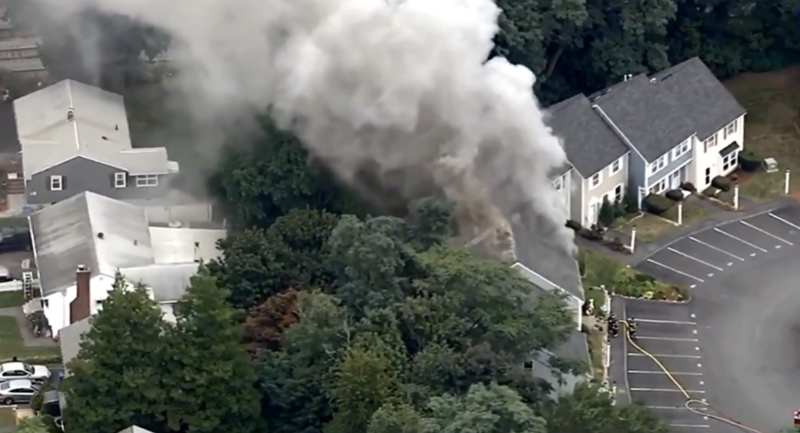 Emergency response crews are responding to gas-related explosions in three separate communities in Massachusetts' Merrimack Valley region, local media reported Thursday. Three people, including a firefighter, were directed to the Lawrence General hospital after being injured. State Police have confirmed 70 fires, gas, or investigations of gas odors in Lawrence and in North Andover. However, numbers are expected to grow. At least one home has been reported as being completely destroyed. According to local newspaper the Eagle-Tribune, the fires are the result of a problem with the gas line that homes and businesses in Andover, North Andover and Lawrence are connected to. Massachusetts State Police have told residents in all the affected communities who are served by Columbia Gas to evacuate, as the company is depressurizing its gas lines in response to the incidents. Residents are being urged to shut off their gas lines and evacuate their homes. Lawrence Police Chief Roy Vasque told the Tribune that "he's never seen anything like this." Both Andover and North Andover are currently being evacuated by officials. According to the 2010 census, Andover and North Andover had a population of 33,201 and 28,352, respectively. Locals in South Lawrence are being asked to evacuate as well since officials will be conducting a "planned power shut down." ​A Lawrence police officer was quoted as saying that "homes are exploding like crazy." ​The gas company told NBC News that residents who smell gas in their homes would immediately leave the grounds and refrain from opening or closing any windows or doors.